I've been reading this series since the first book. I love the main characters of Dillon and Sherlock, FBI agents who married to each other. The books are always a mix of their married, a mystery that or one or both of them are working on, and a secondary mystery that usually introduces another couple, one of whom is usually not an FBI agent. There's action, romance, humor, and an intriguing mystery or two. The two story lines usually come together. 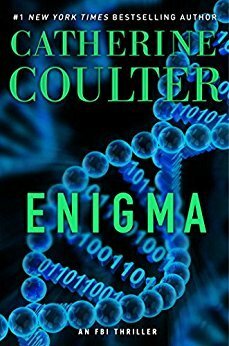 In "Enigma" we get all that in a story that also blends medicine, science, an unethical scientist, family, a kidnapped baby, theft, blackmail, and death. "Enigma" is a quick read even though it's more than 400 pages long. The story is fast-paced with a lot of action. I wouldn't call it thrilling as I never once believed any of the main characters or the the FBI agents were in serious danger. Coulter may have them get shot or injured but there's never any serious harm and of course, they don't die. This despite the fact that the agents are quick to rush into dangerous situations, well, most of the time. The FBI is a government bureaucracy, you know there's red tape and procedures! Yet,we see little of that and little in the way of repercussions for their behavior. I have doubts that the FBI really works the way that Coulter's FBI does. I enjoyed the character interactions and trying to guess how the different plots would come together. Some of my guesses were right and some weren't. I wish the medical plot had more depth to it and more detail. Frankly, that could have made for a compelling story all on its own. The escaped con story did keep my guessing and there was a twist at the end that I did not see coming. Overall, not a particularly thrilling story but one that kept me reading and kept my interest. And though it's book 21 in the series, it works fine as a stand alone.